EPISODE 6, SEASON 1- "SNAFU"
Tonight's episode was kind of so-so in my book. It featured some great performances once again from the cast. The story itself is starting to get interesting and the biggest shocker for me was the death of Chief Dooley. Shea Whigham is one of the most underrated actors of his generation, and he has always been one of the grandest highlights of this show. Whigham has always believed in everything he does and he has brought unrelenting and inspiring charm to the character of Chief Dooley. On tonight's episode, Leviathan has begun to execute their plans. Dr. Ivchenko (Ralph Brown) stole a certain weapon invented by Howard Stark. Leviathan retrieves the weapon and detonates it in the middle of a movie theater auditorium. After the events of last week, I figured Peggy Carter, played gracefully by Hayley Atwell, would be under the ringer for parts of the episode. The SSR believes her to be a traitor, and rightfully so, they do not understand what has been going on and who the real enemy is in their midst's. The thing I didn't expect was for the interrogations and "I don't believe you's" to last nearly the entire episode. In the grand scheme of things, this was a pretty boring episode. Despite the big shock moment at the end, nothing much else happened. I took nearly the entire episode for Carter's co-workers to believe that she is telling the truth. Then we only got a few minutes of real action and tension. 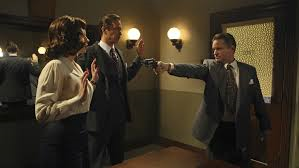 Sure, there were a couple of funny moments between Peggy and Edwin Jarvis. I have liked D'Arcy's work as Jarvis all season long, and he certainly contains good energy between cast members. I also liked that we learned a little bit more about Dr. Ivchenko, even though it was not too much. Still, to my knowledge, he is not based off of anyone in the comic books. Despite some interesting scenes, there was not much to tonight's episode. I also had a little bit of a problem with the weapon Leviathan stole in tonight's episode. If you had a chance to see "Kingsman: The Secret Service" this weekend, you may agree with me to a degree. Samuel L. Jackson's big weapon in that movie is drive people nuts to the point that they kill each other. The gas Leviathan steals from SSR is some kind of gas that apparently drives people nuts to the point that they kill each other. This arrives a little odd since the airing of this episode coincides with the release of that movie. I couldn't help but spot these similarities and find them so weird. Overall, I am expecting big things for the season finale next week. All the pieces are set and now I hope we get a good finish to this first series. It has been rocky, but that doesn't mean it can't close out in style.